Murray Perahia may be the finest concert pianist currently before the public. During intermission chat for his Montreal recital this week, the recurring word was “perfection” – and this was before Perahia tackled Beethoven’s mammoth Hammerklavier Sonata. The program’s first half encompassed works of Haydn, Mozart and Brahms that are standard for student exams, auditions and recitals worldwide. But you won’t hear many students, even the best ones, play them as Perahia is doing for his North American spring tour which winds up in New York on Sunday. In Haydn’s Variations in F minor he revealed unprecedented color, texture and overall finesse which made a hackneyed work sound fresh and inspired. The right hand melodic flourishes along the way were just one of many elegant touches. Similarly in Mozart’s Sonata in A minor, with its familiar “dum.. dum.. da-dum” melody which is so readily made routine, Perahia brought inflection to every phrase and every change of mood, especially in the final movement which had a near-macabre feel. His Brahms group opened with the Ballade in G minor. From the first note Perahia played with crisp definition then a lyrical lied-like quality in the mid-section which made listeners hear the work anew. In the brief Intermezzo in C major he brought a discreetly hesitant rubato to the opening then again a lyrical contrast before it ended. The Intermezzo in E minor is longer and thick textured, then ends with a sudden light flourish redolent of the final cascade in Chopin’s Barcarolle – Perahia played this gem-like coda with the easy aplomb of Vladimir Horowitz at his most magical. (Horowitz was not among Perahia’s formal mentors, though the two became friends in the later 1980s and this generated a renewed interest in Romantic repertoire for Perahia.) Again, there was a warm melancholy for the Intermezzo in A major and lots of beefy bass for the Capriccio in D minor which brought the Brahms group to an energized conclusion. After intermission it was Beethoven’s monumental Hammerklavier Sonata, among the most technically and intellectually demanding works in the entire repertoire and one which has exhausted and eluded more than a few fine musicians. Horowitz, for example, dismissed it as “too long” and never performed it (though often programmed the preceding Sonata in A major, Op.101 which Beethoven had also named Hammerklavier). Claudio Arrau played and recorded it infrequently and told friends the closing fugue was “chaotic”. Rudolf Serkin and Glenn Gould each recorded it in 1970 and their performances seem little more than guarded sight reading. Well... Murray Perahia has made it clear that he certainly can – he swallowed it whole, though I don’t mean to imply a showy or otherwise egotistical performance. He has mastered this work totally, performing it with comprehension and confidence that enable him to toss it off with the ease of far less demanding works. From the opening’s first note, a bass B-flat leading to repeated chords with both hands, Perahia demonstrated a focus which immediately let listeners know he understood the work from start to finish with all its permutations, details and exotic, ever elaborate structure. He never once let trees (big or small) distract from his view of this sometimes cosmic forest. Moreover, because of his confidence he seemed to humanize the work in a way which is genuinely rare. 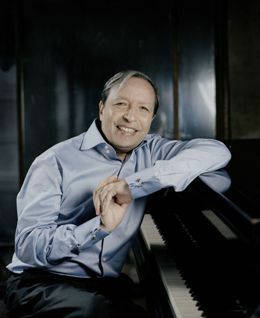 Another emerging aspect of Perahia’s perspective on the Hammerklavier is that he brought a distinctly Brahmsian quality to the brief Scherzo and to the lengthy Adagio sostenuto. The ongoing shifts in texture, rhythm and mood all point toward Brahms and this would have been evident even if Perahia had not been playing that composer’s work earlier in the program. As for the Hammerklavier’s final movement (a Largo introduction leading to a gigantic fugue, Allegro risoluto, derived from an enervated, highly rhythmic subject), Perahia never once lost sight of the work’s most dense structures and rhythms. The introduction can seem meandering, but Perahia maintained a sure, tight grasp holding everything together, and his performance likely reminded many of the opening of the final movement from Beethoven’s Symphony No. 9. Again, there were allusions to future Brahms – octave trills like those in Brahms’ Piano Concerto in D minor and sonorities which clearly influenced Brahms in his Variations and Fugue on a Theme of Handel, though Brahms’ fugue in the latter is child’s play compared with what Beethoven created for the Hammerklavier Sonata. One final point: Perahia’s sound was beautifully presented in Montreal’s fairly new Maison symphonique which provides an aesthetic and aural cocoon of light-toned wood ambience – a beautiful locale to be in and to hear superb music.